Paul is a CERTIFIED FINANCIAL PLANNER™ practitioner and independent wealth advisor for individuals, families and small business owners. After graduation from the University of Florida, with a Bachelor’s Degree in Finance, he began his career with the Florida Department of Insurance in the Office of Insurance Regulation. In March of 2005, Paul entered the Financial Services industry, joining a nationally recognized actuarial firm and working with small to medium sized company retirement plans. 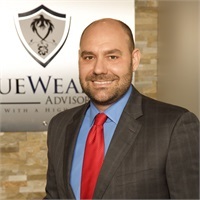 In 2009, Paul joined ProEquities as an Investment Advisor and holds the advanced designation of Chartered Retirement Plan Specialist (CRPS) from the College for Financial Planning in Denver, CO.
Paul is grateful to be a founding member of TrueWealth Advisors, LLC, established in February 2014. Originally from Apalachicola, FL, Paul is married to the former Shellie Davis of Grand Ridge, FL who is a Dermatologist at Inverness Dermatology & Laser in Hoover, AL (Dr. Shellie Marks). They have been married since 2003 and are the proud parents of 2 beautiful girls. They are active members of The Church of the Highlands in Birmingham, AL. Please be advised that presently Paul B. Marks holds series 06, 07, 63 and 65 licenses and is registered in the states of AL, AZ, FL, GA, IN, KS, MS, NC, OK, SC and TN. Click here to schedule an appointment with Paul.